Margaret Guilfoyle would have been an unusual candidate for any political party when she stood for election to the Senate in 1970. Decades before such arrangements became commonplace, flexible working hours allowed Guilfoyle to combine her career as an accountant with raising her three children. Her qualifications and experience later boosted Guilfoyle's chances of obtaining a seat in Parliament, and gave her skills that equipped her to enter the Fraser ministry and eventually Cabinet, while her status as a working mother proved an irresistible angle for journalists throughout her political career. Margaret Georgina Constance McCartney was born in Belfast, Northern Ireland in 1926, the second of three children of former teacher, Elizabeth Jane McCartney, née Ellis, and William McCartney, a civil servant. The family migrated to Australia in 1928, and settled in Melbourne. Margaret's father died when she was ten, and her mother faced the difficult task of raising the children without the help of extended family. The experience showed Margaret the importance of education and careers for women. She later said that she became aware that 'at any time, a woman must be capable of independence'. Margaret received her initial education at Fairfield State School and Westgarth Central Business College. At the age of fifteen she was working as a secretary while continuing her studies at night, at Taylors Institute of Advanced Studies, and finally at the Royal Melbourne Institute of Technology, where she studied accountancy. By 1946 Margaret was a qualified accountant and chartered secretary. A year later she was head office accountant at Overseas Corporation Australia Ltd, a firm that promoted Australian exports. She had the benefit of professional qualifications that many young men her age lacked, as they had been on active service while she had been studying. When they returned, Guilfoyle was not displaced from her job, as qualified accountants—of either gender—remained in short supply. On 20 November 1952 she married Stanley Martin Leslie Guilfoyle, an accountant and later company director, and the couple had three children, two daughters and a son. Although she preferred working for a large company, moving into private practice gave her more time with her family. As a young couple the Guilfoyles were both active members of the Liberal Party, having joined the South Camberwell branch together in the 1950s. Margaret Guilfoyle was identified as talented by the women's section of the party, and encouraged to take various roles within the section, culminating in chairing the Victorian women's section from 1969 to 1970. She was also a member of the party's State Executive (1969–70) and Federal Council (1967–70). Guilfoyle was close to women like Ivy Wedgwood, Elizabeth Couchman and Edith Haynes, who had haggled with Robert Menzies over the formation of the party and remained influential several decades later. Wedgwood mentored Guilfoyle during her years in the women's section, and when Wedgwood retired from the Senate, Guilfoyle was encouraged to replace her. Couchman provided a reference for the preselection. Guilfoyle won preselection from a field of some twenty candidates. During the preselection interviews John Jess (MHR La Trobe 1960–72) asked Guilfoyle who would look after her three children if she became a senator. Her response amounted to a polite reminder that this was none of his business. 'I'm asking you to make a decision to give me responsibility to be a representative in the Senate and I would ask that you would accept that I have responsibility to make the decisions regarding my family'. Placed second on the Liberal ticket Guilfoyle was elected to the Senate in November 1970, her term commencing on 1 July 1971. She soon took committee roles that were in line with her own professional experience, but perhaps at odds with the expected policy interests of a woman at that time. She was offered the opportunity of joining the Senate Standing Committee on Health and Welfare, but Guilfoyle believed that because of her accounting background, she could 'do better' as a member of the Senate Standing Committee on Finance and Government Operations. She also joined the Public Accounts Committee and served on estimates committees. When Guilfoyle made her first speech to the Senate, during the Budget debate on 15 September 1971, her financial expertise was obvious in her discussion of 'disproportionately high infrastructure costs' borne by the mining industry, but she also ranged well beyond economic matters. She was troubled by the pressures placed on the environment through pollution and population growth; and the greater part of her speech was devoted to the arts. Guilfoyle expressed her 'strongest support' for increased arts funding, describing the three years since the formation of the Australia Council for the Arts as 'an inspiring movement towards an involvement of government in supporting the arts'. She was disappointed by the deferral of plans for a national film television training school, and declared her 'personal interest in the future development' of an Australian children's film foundation. Guilfoyle would later become a director of the Australian Children's Television Foundation (1989–2003) and serve on the board of the Victorian State Opera. Over the next three years Guilfoyle spoke mainly on the economy, but her speeches and numerous questions also canvassed matters such as drug abuse, higher education, Aboriginal health, the Australian Security Intelligence Organisation, social services, child care, and the two-airline policy. She gained a reputation as a succinct and clear speaker who was in control of her material. In June 1974 Opposition Leader Bill Snedden appointed Guilfoyle to the shadow ministry, with responsibility for the media. When Malcolm Fraser became leader of the Liberals in March 1975 he had Guilfoyle's support, and she was appointed shadow minister for education. 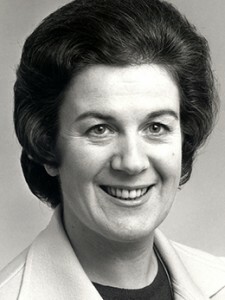 Joan Kirner, a future Victorian ALP premier, and at that time president of the Australian Council of State Schools Organisations, described Guilfoyle as the 'architect' of the Coalition's education policy. Kirner gave credit to Guilfoyle for her 'competent guidance' of two key elements of Coalition school policy: the promotion of equal opportunity, and community participation in schools. Guilfoyle described 1975 as her hardest year: in a politically volatile period she had the assistance of just one staff member. Between June and October of that year the Whitlam Government suffered a severe defeat in a by-election for the Tasmanian seat of Bass; several senior ministers were sacked or resigned; and the government's reputation was tarnished by the Khemlani loans affair. By October the Liberal leadership had decided to block supply and force the Whitlam Government to an early election. Guilfoyle supported this approach. The deadlock in the Senate continued until 11 November 1975 when the Governor-General, Sir John Kerr, dismissed the Whitlam Government. Malcolm Fraser was appointed caretaker Prime Minister, until a general election was held on 13 December 1975. Guilfoyle served as Minister for Education in the caretaker government. Following an emphatic Coalition election victory Fraser appointed Guilfoyle to the outer ministry as Minister for Social Security, replacing Don Chipp, who was dropped from the ministry. The Fraser Government moved immediately to reduce the role of government and embarked on an anti-inflation drive. As a major expenditure area, the Social Security portfolio was a central battle ground in the early years of the Coalition ministry. In the first few months of the new government Guilfoyle tightened unemployment benefits and indefinitely postponed the Whitlam Government's promise to abolish the means test on pensions for all people aged sixty-nine and over. She also questioned the growing number of women receiving the supporting mother's benefit. Those who feared more substantial cuts to social security had underestimated two factors: Fraser's support for largely shielding social security from cuts where possible, and Guilfoyle's personal understanding of the human impact of her portfolio. The Fraser Government's reforms to child endowment were the most significant since those of the Menzies Government extended it to first-born children in 1949. Under Guilfoyle tax rebates were removed for dependent children and the cash amount paid to parents was increased. Renamed family allowance, it was paid directly to mothers. The changes provided a greater benefit for low income families and answered critics who argued that child endowment had not kept up with inflation. Guilfoyle was not the initiator of the family allowance policy, the idea coming from Fraser's advisers, but she insisted that if family allowances were to be introduced, they had to be made permanent. Fraser agreed, and in 1979 he supported Guilfoyle in resisting great pressure from government backbenchers and Cabinet ministers to means test family allowances. Guilfoyle was also appointed Minister Assisting the Prime Minister in Child Care Matters, a position she held until June 1976, when it became part of her Social Security portfolio. In this role she delivered the Coalition's promise to abolish the Whitlam Government's Children's Commission and replace it with the Office of Child Care. With assistance from Marie Coleman, who headed the Office of Child Care, Guilfoyle established the role of the Commonwealth in day care and out of school hours care. In March 1976 Guilfoyle was able to announce 144 new child care projects, which also included funding for preschools to expand their activities. This marked the start of the growth of the modern child care industry beyond the minimal framework previously provided by the not-for-profit sector, which was struggling to keep up with the demands of increasing numbers of working mothers. Guilfoyle and Coleman also laid the groundwork for Commonwealth funding of youth refuges and set the pattern for Commonwealth support of Indigenous children and their families, including through the Aboriginal Child Care Agencies. Guilfoyle had no interest in taking the role of Minister for Women's Affairs, which continued to be held by male ministers during her years in the ministry. Yet Guilfoyle's gender was continually referenced by the media. When she was appointed to the Joint Prices Committee, Melbourne's Herald newspaper described her as 'a housewife with a big say on prices'. The Sydney Morning Herald, upon her appointment as shadow minister for education, described her as 'A mother with political ambitions'. She was also regularly described as the 'iron butterfly' and compared to Margaret Thatcher. Guilfoyle did not welcome such comments, remarking that 'the image of a hard woman bothers me' and pointing out that in her sensitive Social Security portfolio it was necessary 'to try at all times to be fair and reasonable'. Women were still rare in the federal Parliament despite the huge numbers of women who joined the paid workforce in the 1970s. After the 1975 election the ALP and the Liberals each had three women in the Parliament. Women who sought preselection from the Liberal Party were inevitably compared to Guilfoyle, who had set a formidable standard. 'She did it so extremely well', said Dame Beryl Beaurepaire, 'I think she made it rather hard for others because they would think that they would have to be as good as Margaret Guilfoyle'. She had a tremendous gift of making a strong political point very simply. She would be able to convince the Cabinet what would fly and what wouldn't, what they could get away with and what they couldn't, and what debate would be really tough to them if they wanted to take it on. perhaps the nicest headline I ever had during my time [as a minister] was the one in a Sydney paper that said, 'Minister Unhelpful'—unhelpful in cutting the programs that coherently gave income security to millions of people ... and maybe unhelpful in trying to persuade other ministers that there were essential matters that needed to be built upon and not destroyed from time to time. Following the 1977 election Guilfoyle argued that to simply maintain current social security programs meant increased expenditure and, in 1979, after negotiations with Fraser and Lynch's successor as Treasurer, John Howard, she eventually obtained a sizeable increase in the social security budget. Guilfoyle's success in these battles was partly due to her meticulous preparation, a habit noted by many of her contemporaries. She ensured she was well briefed in any argument, and was conscious she had to fight hard—and with logic and evidence—to prevail over her colleagues. Senior public servants noted Guilfoyle's excellent working relationships with her public servants, and how she gave them full credit for their work: 'As a result, and as well as the fact that she was interested in the fine detail of their briefing, the public service put in the extra to prepare her extremely well'. In 1980 Guilfoyle was appointed Dame Commander of the Order of the British Empire and following that year's election Fraser moved her to the Finance portfolio. Having spent five years defending her portfolio from cuts, she was now charged with looking for savings. From around the time of the 1980 election, the Fraser Government faced growing pressure from backbenchers and commentators to cut public spending and streamline government departments. Fraser agreed to establish a Review of Commonwealth Functions Committee, to identify activities that could be phased out or moved to the private sector. Known as the 'Razor Gang', the committee was chaired by Deputy Liberal Party leader Phillip Lynch and its membership included Guilfoyle and John Howard. The Social Security portfolio was exempt from its terms of reference, although by October 1981 the Committee had identified hundreds of functions that could be reduced or moved from government, and Lynch claimed that three-quarters of these recommendations had been implemented. At the end of 1981 Guilfoyle took on a greater role in budget preparations. Fraser charged her with interviewing all ministers on their budget submissions, a role formerly undertaken by the Expenditure Review Committee (ERC), a panel of five ministers chaired by Howard. Under the new arrangement, ministers would liaise with the ERC only when they could not reach agreement with Guilfoyle. The Fraser Government was defeated at the election of 5 March 1983, when the ALP, led by Bob Hawke, won a twenty-five seat majority in the House of Representatives. Fraser resigned as Liberal leader and was succeeded by Andrew Peacock. Guilfoyle served in Peacock's shadow cabinet, with responsibility for taxation and finance, from April 1983 until the election of December 1984. After the election, in which the Hawke Government retained office, Guilfoyle requested not to be included in the new shadow ministry. She retired from the Senate in June 1987. After leaving Parliament Guilfoyle completed a law course at the Australian National University. From 1995 until 2001 she was chair of the Judicial Remuneration Tribunal. Guilfoyle also took on a number of board appointments in the health and welfare sector, including as deputy chair of the Mental Health Research Institute (1988–2001) and the Infertility Treatment Authority (1996–2002), and president of the Royal Melbourne Hospital Board of Management (1993–95). She was a member of the National Inquiry Into the Human Rights of People with Mental Illness (1990–93). Guilfoyle was a patron of the Women's Forum, which spearheaded the party's successful effort to see more Liberal women elected to the federal Parliament. She was appointed a Companion of the Order of Australia in 2005 for 'significant contributions to public life in Australia in support of hospital and health administration, social justice and education, to young people as a role model, and to the Australian Parliament'. I am not a member of the women's movement but I believe there are a lot of intelligent, articulate women who are giving their own time to get opportunities for other women. I have not been an activist for them because I rather feel I have been extremely busy doing my own thing. It's a channelling of energy. I give my time to a variety of political organisations. Claiming there was nothing different about women in politics, Guilfoyle never complained of discrimination or unfair treatment due to her gender. Equally, she was not prominent in the debates on equal opportunity and abortion that emerged in the Liberal Party during the Fraser years. Guilfoyle's former chief of staff, Rod Kemp (later a Senator for Victoria), described her as an astute judge of people who was able to deal with individuals on their own terms. This made her a formidable Cabinet minister when jousting with her colleagues, but it also translated into personal warmth that won her a rare degree of popularity in the rank and file membership of the Liberal Party and in the broader community. According to ALP Senator Robert Ray: 'She had ability and reliability, and didn't play outside her zone of ability, which was considerable'. Ray also described Guilfoyle as 'very unruffled', and said it was 'hard to get under her skin'. He was impressed by Guilfoyle's capacity to remain calm, whatever the circumstances, and recalled one evening in the late 1970s, when Guilfoyle suddenly choked on a fishbone during dinner at Parliament House and began to turn blue. Senator Glen Sheil a former GP, quickly intervened and removed the bone. With her breath recovered, Guilfoyle resumed her seat at the table, thanked Sheil, and resumed her meal and conversation as if nothing had happened. Guilfoyle was well-suited to the Senate: she was agile in debate and committees but was not a practitioner of the kind of adversarial politics that is more usually found in the House of Representatives. Professional and determined, Guilfoyle's reputation was that of a highly capable administrator, rather than a reformer. As Guilfoyle said of herself: 'Maybe I feel more administrative than innovative and maybe this does typify me'. Yet she did begin the first significant development of the childcare sector in Australia and oversaw the introduction of family allowances. She also had great influence on successive federal budgets during the Fraser years. According to Malcolm Fraser, Guilfoyle 'contributed significantly to cabinet debates. She could be totally relied on and she could think for herself. She wasn't a captive to the bureaucracy'. As the first woman in Australian politics to reach Cabinet rank as a minister, Guilfoyle's performance set a standard of achievement for other women to follow. Margaret Fitzherbert, So Many Firsts: Liberal Women From Enid Lyons to the Turnbull Era, The Federation Press, Syd., 2009, p. 73; Recording of interview of Dame Margaret Guilfoyle by Barry York, 30 Sept–1 Oct. 2009, POHP (access restricted). Daily Telegraph (Syd. ), 27 July 1973, p. 19; CPD, 15 Sept. 1971, pp. 747–53. Media Release, Senator the Hon. Margaret Guilfoyle, 9 March 1976. Age (Melb. ), 20 Dec. 1975, p. 4; Herald (Melb. ), 31 May 1973, p. 26; SMH, 10 April 1975, p. 14; The Bulletin (Syd. ), 24 Jan. 1976, p. 10; Sun-Herald (Syd. ), 27 March 1977, p. 2; Australian (Syd. ), 31 Dec. 1979, p. 1; Advertiser (Adel. ), 4 April 1979, p. 4; Fitzherbert, So Many Firsts, p. 6. Fitzherbert, So Many Firsts, p. 98. Margaret Guilfoyle and Susan Ryan, 'The Trailblazers: The First Women in Cabinet', Australian Womenspeak Conference, Canberra, 31 March 2003, published in Papers on Parliament, No. 41, June 2004, pp. 1–4. SMH, 30 Sept. 1978, p.10; Weekend Australian (Syd. ), 3–4 May 1980, p. 1; SMH, 1 June 1979, p. 7; Russell Schneider, War Without Blood: Malcolm Fraser in Power, A&R, Syd., 1980, pp. 151–4; Brian Buckley, Lynched: The Life of Sir Phillip Lynch, Salzburg Publishing, Toorak, Vic., 1991, p. 186; Fitzherbert, So Many Firsts, p. 103. Daily Telegraph (Syd. ), 27 July 1973, p. 19; SMH, 10 April 1975, p. 14. Author interview with Robert Ray; The Bulletin (Syd. ), 15 March 1975, p. 20; Malcolm Fraser and Margaret Simons, Malcolm Fraser: The Political Memoirs, The Miegunyah Press, Carlton, Vic., 2010, p. 602. This biography was first published in The Biographical Dictionary of the Australian Senate, Vol. 4, 1983-2002, Department of the Senate, Canberra, 2017, pp. 388-393.